There is a small but powerful saying I have heard time and again in meetings with Fender when discussing exciting new product launches. This adage inevitably comes up when the conversation references certain items, made during a very certain time, and it goes like this: “That was during the CBS years”. For true ATB Guitar fans you will know what this implies but for those new to the game this era came to be when Leo, due to health issues, a desire to simplify his life as well as pursue a new vision, G & L, sold Fender Electric Instruments Company in January 1965 to CBS for $13 Million. This transfer of ownership effectively ended a commitment to true Leo Fender quality that would not be seen again for years, however, now that it’s back it is truly back - and with the fire of Fiesta Red. ‘The CBS Years’ lasted exactly 20 years until Bill Schultz and a group of fiercely dedicated investors bought back the Fender name and only the name in an all cash deal of $12.5 million. Gone was the factory in Fullerton, complete with workbenches actually made by Leo himself (such was his attention to detail) and they started from scratch in Corona. Bill’s goals were this: resurrecting Leo’s values of supreme, time tested quality, efficiency and constant innovation while improving on classic Leo Fender inventions for the modern player. I think we can all agree Bill’s dream and mission was accomplished and today Fender and The Custom Shop (which debuted in 1987) are producing incredible instruments at every level that has met and exceeded the hopes and dreams of Bill, however, one can’t deny the allure and mystique of actually owning an instrument designed directly by Leo himself. 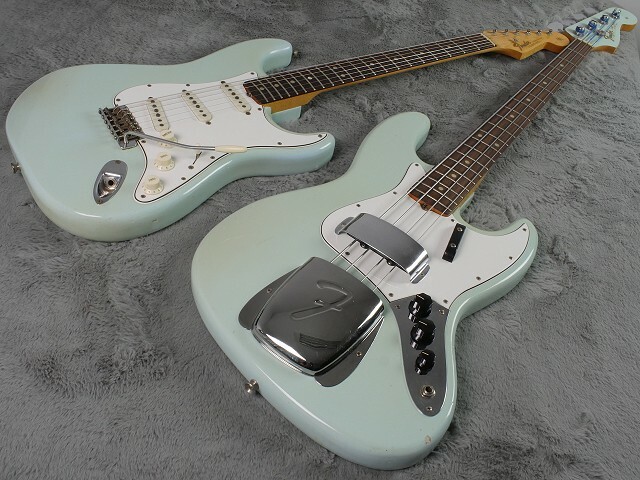 Much like any original it is exactly that – an original from a time we can never get back and these two jewels are destined to be the pale sapphires in the right True Blue Fender collector’s crown. ATB Guitars originally thought these to be Sonic Blue but a couple of well respected collectors have pointed out they are Daphne Blue. Whatever the finer details of the colour turns out to be, they are original light blue, which is one of the rarer Fender Custom Colors. 1965 Daphne/Sonic Blue Fender Jazz Bass: Please take a long, languid look at this museum quality, practically untouched, all original MINT Daphne/Sonic Blue Custom Color 1965 Jazz Bass. The Jazz Bass was relatively new when this came out, having just hit the market in 1960 as a complement to the very first electric bass EVER, named and invented by Leo Fender himself, the Precision Bass. With its refined look, feel and performance (inspired by the wildly popular Jazzmaster Guitar) Don Randall named it the Jazz Bass and effectively was the sports car of Bass guitars where the P Bass was the Muscle Car. Its design is timeless and has effectively not changed since 1960 and we, simply put, consider it instrument design at it’s best. 1965 Daphne/Sonic Blue Fender Stratocaster: Whoever raised this once young man raised him right because he was first given this incredible guitar when he was just 10 years old - and we can’t stress enough what INCREDIBLE condition it is in. He grew up to be a doctor and even though I don’t actually know I would be tempted to guess he became a surgeon given the attention and meticulous care afforded this incredibly rare guitar. This beauty is not only Daphne or some say Sonic Blue but comes with a small headstock, the transitional logo along with its original case, letter from original owner and some case candy. It is near MINT condition, there being just a few small dings here and there, some fine checking and a small amount of grime on the metal parts. This is one guitar that we can say with 100% confidence is completely original. There is not a single screw out of place, no broken or disturbed solder joints, zero touch ups, over spray or any other nastiness to be found anywhere. It is a genuine ZERO issues guitar in an incredibly rare custom color that will be the envy any guitar collector the world over. Like larger frets? She has factory fitted larger frets so she plays like an absolute demon - or angel - depending upon your mood. There is no wear or divots on these original frets and behold the beautiful, dark rosewood fingerboard. All three, hand dated 1965 grey bottom pickups are evenly powerful and chime well with super Strat loveliness. The original owner is a very nice chap and has included a personal statement with his name and telephone number should you wish to call him and chat about this amazing instrument. There is included some case candy from the period including 1966 tuition books, a strap, bridge cover, cleaning cloth and a repro 1965/6 Fender catalogue. Correct case is also in great shape like the rest of the guitar but typically for this period, has a bit of the logo broken off and one latch does not close. We all have a few dings, right? Same here but these are superficial and concern the case only and just adds a bit of character to this mature lady - with no depletion in value. She can still fit in her wedding dress after all these years and weighs in at just 3.60Kg and feels very comfortable in your hands. There is no choking of strings anywhere on the fingerboard and she also happens to have a very good sustain to boot. Tempted? We encourage anyone wanting to pick it up to come visit ATB and play it, we are certain you will not be disappointed and in fact be damn impressed and grateful to her former owner for her beautiful condition and incredible grace. We hope we have tempted you to add these Blue jewels to your crown and should you have the time and inclination please pay us a visit, just let us know you are on your way. We are only 2 hours west of London by train or car, in historic Cheltenham. We’ll be sure to provide a warm welcome and lots of period correct amps to help you find that perfect sound as Leo intended. He was an amplification man before he ever invented his first solid body guitar. Leo never designed an instrument without a way for it to speak, it was always a love match – here at ATB will be sure to help you find yours.